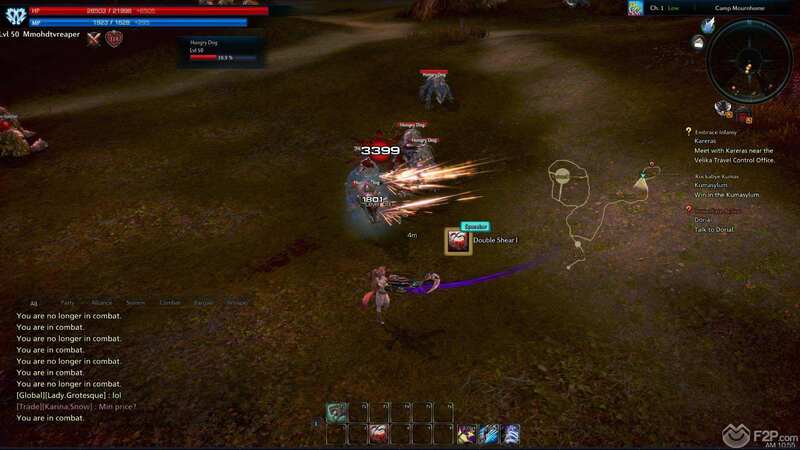 We recently checked out TERA (The Exiled Realm of Arborea) to have an extended first look gameplay at the new Reaper class that has been released for the game taking the number of available classes up to a healthy nine. For the first time a class has been restricted to a single race, here it is the cutesy, rabbit eared Elin that have been so blessed (one of the main reasons for this it is speculated is the amount of time it takes to create new character animations, though we don’t expect we’ll see the other races getting access to the class any time soon). The Reaper is a light armoured mid ranged DPS combatant that transfers dark energy into their chained twin scythe blades that on leash powerful area attacks and takeout multiple enemies throwing out knockdowns, storms and immobilisations. Check it out in our first look video. The new class is only accessible to those players who already have a level 40 character, once your account has such a character then players can create a new character as a Reaper, automatically starting at level 50. Players need not worry too much if they’ve already maxed out their eight character slots with other classes, En Masse have upped the number of character slots to 12 giving all players a chance to try out the new class. With the Reaper comes a new starting zone, Ashen Hope, the area of Pora Elina now stands in the aftermath of a gigantic explosion and players must navigate through the zone fighting off various Orcan mobs, helping evacuate refugees from the area and generally being the hero of the hour. Starting in the new zone we come equipped with only a handful of our skills and by speaking to a number of the different NPC’s, beating up training dummies to prove that we are worthy challengers for the aforementioned “hero of the hour” title. The attacks themselves are pretty spectacular looking, the huge of damage that they can do chained together (haha, nice pun Goodfellow) with combo attacks and the repeated knockdowns meant that there was no real challenge throughout the entire experience and we were taking on packs of eight mobs at once without barely suffering a scratch. 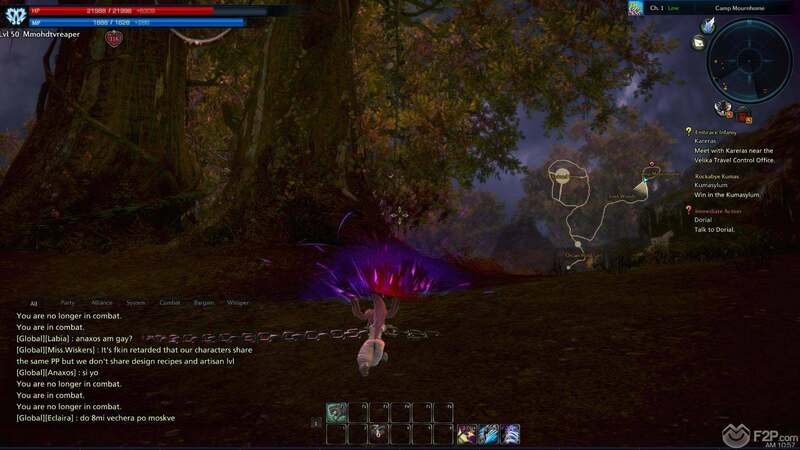 At one point we must of had around 20 mobs on us and was the only time our health bar to the serious dip. This whole was probably worst part of the experience, 40 minutes in and halfway through the zone with already almost hit level 55 (out of the level 60 cap), had barely seen any challenging combat and would no doubt have hit the by the time we completed the zone with just natural gameplay and no grinding. It all seemed a little pointless, we know there are greater challenges in the game that really test players combat abilities, and whilst the area was a new zone for the Reaper, it’s still only accessible by players that have had 40 levels of gameplay on a previous character so it really should have been much more of a challenge than it was. 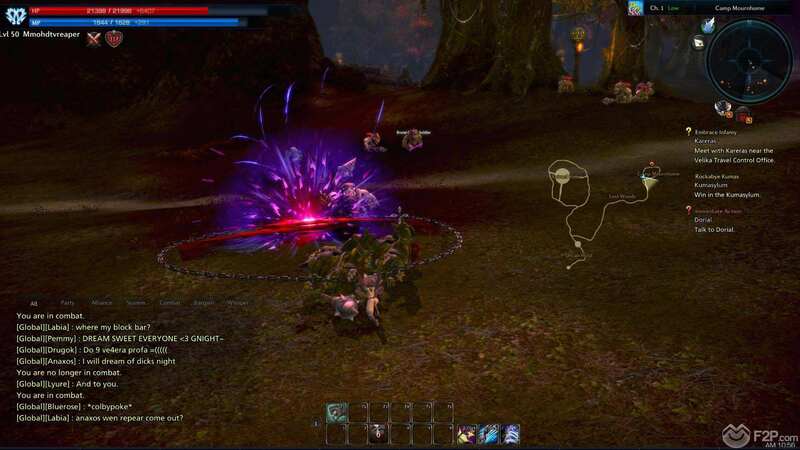 Fifty percent of the quest chain revolved around simply running to the next NPC to talk to them and get more exposition for what was happening in the area to then go and kill the next types of mob that you are about to come in contact with as you follow the very linear path towards the end of the zone. The area itself looks nice enough, particularly the final “Ruined Elinu” burning tree village type area, but other than that most of the mobs looked relatively similar, scaled to a level where they were never too much of a challenge and the exploration element was pretty much non-existent as the map and path really was on rails. Ultimately what we took away from the experience was that the starter zone was just a bit of added fluff that players could burn through in one session to then have a Max level Reaper to get involved with the endgame content in the normal areas, dungeons, etc. It would definitely be interesting to see how the Reaper holds up in PvP, but given that it’s a new class that is easily maxed we dare say the PVP areas will be oversaturated with Reapers for the near future as players try them out.